#4 Christmas Week - Adorable & Fun Chimney Gift Box! Welcome to my Blog & project #4 of my Christmas Week! Today i have such a cute & fun gift box for you. 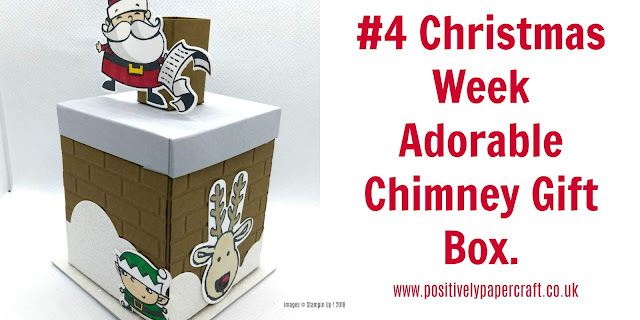 Its meant to look like a chimney & i think Kids would love this! You could fill it with lots of sweets or anything you fancy really. It was great fun to make & decorate and is very easy to. To get the brick effect on my chimney i used a Brick embossing folder. Stampin Up! used to have one but its now retired. I bought mine from Craft Stash so i am sure you can pick one up if you don't have one. I used dazzling diamonds glimmer paper for the snow. In case you missed yesterdays project, #3 Christmas week Easy pop up tree card, i have popped the link below so you can check it out. SOFT SUEDE CARD FOR THE BOX MEASURES 10 1/2" X 5 1/2"
SCORE THE LONG SIDE @ 2 1/2", 5", 7 1/2" & 10"
SCORE THE SHORT SIDE @ 3"
SMOKY SLATE CARD FOR THE LID MEASURES 3 9/16" X 3 9/16"
SCORE ALL 4 SIDES @ 1/2"
SOFT SUEDE CARD FOR THE CHIMNEY POT MEASURES 3 1/2" X 2"
SCORE THE LONG SIDE @ 3/4", 1 1/2", 2 1/4" & 3"
STAND/BASE OF THE BOX MEASURES 3 X 3"
I hope you will have a go at making this adorable little box. 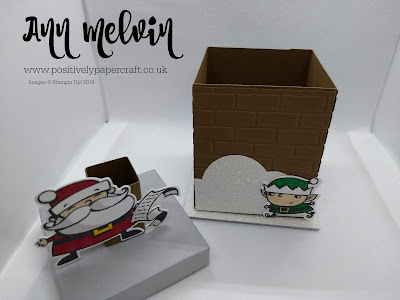 Please check out my YouTube Tutorial which has step by step instructions on how i made the box. I will put the link at the end of this post. Ho! Ho! Ho! . . . this is a great treat box . . . or whatever you put inside . . . I will have to look for that brick embossing folder. Thaaaaaaanks!!!! What a cute box for so many goodies!! Thank you for your inspirations.